It is a great joy and blessing for me to be here, back in California, as Fr. Paul said. I grew up in the East Bay, from age ten to nineteen -- before I went away to college. And I spent my formative three or four years before I went to Greece in this area, going to St. John, the relics, and Platina, and many other places. So, it's a joy to be back. Actually, in this place right here, I met Elder Ephraim for the first time twenty-four years ago, so this brings back a lot of memories. My topic today is “Have Faith,” and the directions that I received from the director of the conference -- who I want to thank for inviting me. She's done a tremendous job. Thank you very much, Christine, for inviting me and allowing me to be here and to speak to you, as well as Fr. Noah, who is an old friend on the East Coast, who’s involved as well -- regarding the topic, I was told, “This needs to be motivational. We need to give people courage in this struggle for home education, and not just for educating, but actually imparting the faith.” I think this is one of the main reasons why we're all here and why we're all believers in homeschooling and struggling to continue, is that we understand what's at stake is not simply the education of our children, but the faithfulness of our children to Christ. And this is why today I'm going to focus a little bit – as a jumping off point – on homeschooling in relation to state compulsory schooling and history, because I think it's important for us to see the big picture. A lot of us, we start out homeschooling, we're looking at our small children, and we look at the various things we need to do to impart to them the basics, and a lot of us are uneasy: are we really capable? Can we really do this? But if we step back and see the larger picture, I think it's very encouraging. It's also very frightening, when we see the history of compulsory schooling. But it's also encouraging, because we see that homeschooling is so very necessary, not just for ourselves, but for the Church and for the survival of the Church as we go forward. I started out my homeschooling in Greece about 18 years ago, and you might not know, but in Greece, it's actually illegal to homeschool. It's not allowed. You have to send your children to the state school. It's kind of ironic that here we are in California and you are free to homeschool, but in Greece you are not. So, as an American citizen, I did it anyway. I was an illegal homeschooler for my entire 18 years in Greece. And I want to tell you a little story about what I encountered with the Greek state schooling system, because I think it's encouraging, in that it shows that God is above all and encourages us in everything we do. About two years into homeschooling, I was in the village up in the mountain outside Thessaloniki where we lived, a very small village. And eventually someone said, "You know, Fr. Peter, who's the priest of the village, is not sending his kids to school. What's going on?" And they told the school down in the next city, and the school officials called us in and they said, "You need to be sending your kids to school." And we said, "Well, actually, no we don't. I'm an American citizen, and in America this is the kind of education system that we have, and our children are enrolled there online." We were enrolled with St. John of Shanghai and San Francisco Academy, “distance learning,” we called it. We presented them the paperwork, and they didn't really know what to make of it because probably in Greece there's about five or ten people who homeschool, and they're probably all foreigners. In any case, he said, "I have to submit the paperwork to the state because this is a requirement. You have to send your kids to school.” And then he tried to convince us why it's so important to send our kids to school. Of course in Greece, comparatively, you might say, “Well, why, Fr. Peter, did you feel it's so necessary?" You'll see after I present about compulsory state education why I think it's necessary. Comparatively, fifteen, eighteen years ago things were much better – and probably much better than California in terms of what kind of influences they were bringing into the school system. But it goes beyond just the threats, the moral problems in the school. It goes to the whole heart of what it means to raise a child, how to raise a child, how that child is going to react to you, and when he should start learning, and when he or she should start leaving the house and being far from the mother and father. There's a lot more to homeschooling than just the education. It's much more involved. Compulsory state education is actually much more diabolical than it looks, when you understand the history. So we stood our ground and he sent the papers to the state of Greece, the department of education, and we never heard from them. And we did our education for the next fifteen years in Greece for all of our children. I still don't know what happened, but my guess is they just said, “Why bother with the crazy priest up in the mountains from America?” And then we learned as we went on that there were more Greeks becoming interested in homeschooling in Greece. We learned that other people had fought to have control over the education of their children as well in Greece, and they had been successful. Some had sent their children abroad, and others had done school via the internet. And increasingly, what's happened in Greece since that time -- just to share something that I'm sure most of you don't know – has been the introduction of transgenderism, homosexuality, teaching sexual education to very young children. And many other things have been introduced into the schools in Greece, with the result that there have been more and more people who are interested in homeschooling in Greece. So, let me begin by going through this slideshow presentation. Then we'll stop and talk about this whole question of faith, give you some examples, and hopefully we'll have some time at the end for questions and answers. This will be a little bit repetitive for some of you; if you've been homeschooling you probably know some of this, but I think that once we get to the compulsory state education history, that will be hopefully interesting and new for all of you. 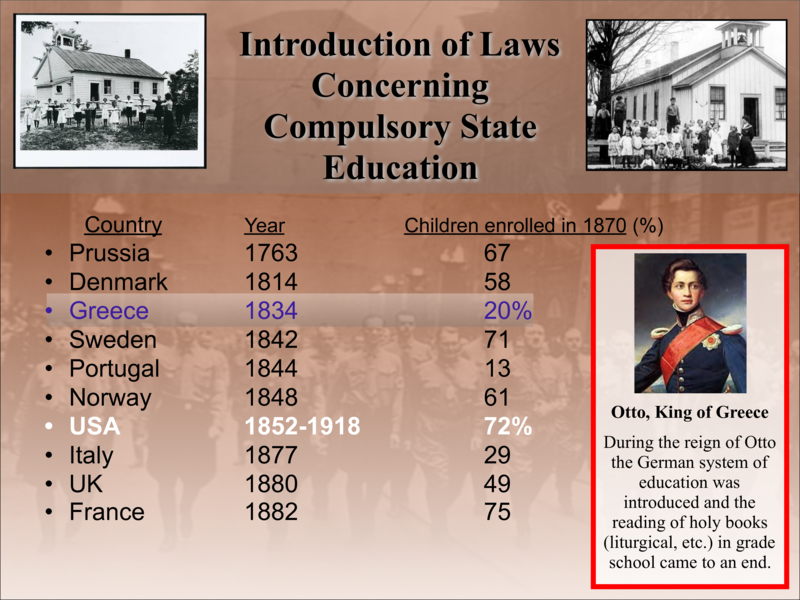 What I'm going to look at in this short presentation is homeschooling around the world today, the history of compulsory state education, and why it’s not an option but a necessity that we homeschool our children. Many times people say, "Well, you know, homeschooling is so restrictive. The child is not allowed to socialize.” And in Greece especially, that was the line that I heard continually, that you have to socialize your children, you have to become a part of society. And of course, who isn't for good socialization and learning all the skills of the social life? The question is, what kind of socialization? And what are they learning? As Orthodox Christians, first and foremost, we want to impart to our children the path of the commandments, to initiate them into the mystery of Christ, to have in their life examples of virtue; and so socialization for its own sake is not good. Socialization so that they might become children of God and brothers and sisters in Christ is absolutely what we all want. And in the popular mind, which is not looking at it from the Orthodox Christian's perspective, the myth is that to be a homeschooler, your children are going to be isolated and afraid. The reality is just the opposite, if you're doing your homework as a homeschooler; of course, it's all dependent on the grace of God, and our struggle. The reality is that public schooling is impersonal at the end of the day, and it's not going to deal with the needs of each child. It's not personal one-to-one, and it's not going at the pace that the child needs. I was just in New York, talking to one of my fellow professors who had to stop homeschooling. She was pregnant and gave birth, and she had to send her child to a private school for about 6 months. She said after being homeschooled and after being tutored by what I think was a Montessori-type education, her daughter was extremely bored and restless in school. This is one of the side-effects, that when the child is really engaged early on and learns to love learning, and love discovery, and love the interaction on a personal level, then if they go to school, they are very restless, and then bad things start to happen. Very bright children usually have this problem. They have so much energy, and so much ability to learn, that if you're not continually feeding them, they get involved in things that are not profitable. So this is the myth, that we're very restrictive in homeschooling and that it's deficient, when in reality it's just the opposite. I know I'm speaking to the choir here, but homeschooling unites families. It gives students opportunities to excel, it widens horizons, and it protects innocence -- one of the things that the world's not going to tell you you need to do. The world is not going to come and say, "the purity of the soul of your child is most important." No one from the state school or from society is going to say that, and yet that is one of the most important things you can do as a parent, is to protect them from defilement in images and in concepts. That is not going to happen in a social setting in contemporary schools. Homeschooling is going to deepen faith and morality – one of the reasons why it's going to do that is because the child is going to see much more of his or her parents living out the faith on a daily basis. One of the great blessings we had in Greece was that my children were constantly with me on feastdays and we were going to church, or we were going to pilgrimages; the restriction that school would have given to us was not present. So as a family, but also in terms of the faith, they had many more opportunities to grow. Homeschooling also promotes healthy children, for a variety of reasons, because usually children are getting sick in school, and not just physically, but also spiritually. One of the other myths is that homeschooling is a great innovation and that this is something that started in the 20th century. 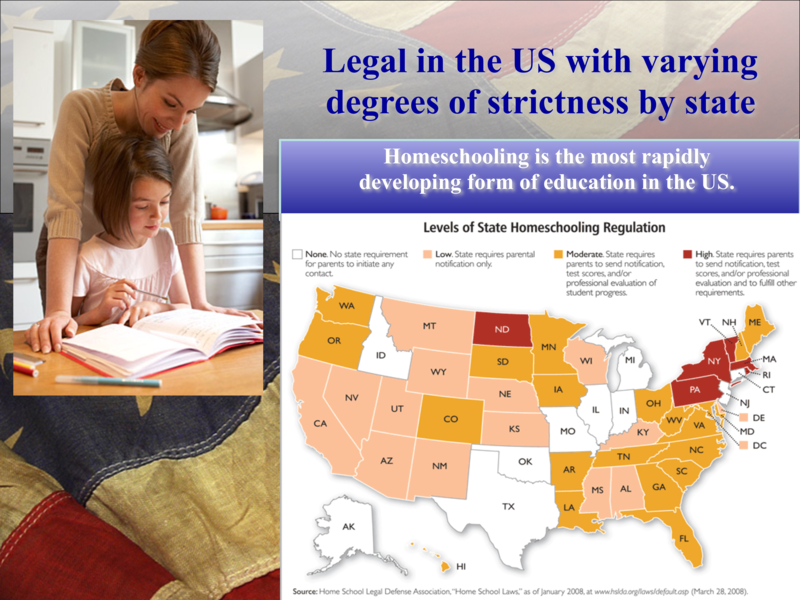 In fact, homeschooling is the norm, and the innovation is compulsory state education. From the time of the 4th century, the Church Fathers' elementary education -- ages seven to fourteen -- was done exclusively at home. St. Basil the Great: when do you think he went to school? The great St. Basil, who everybody refers to in terms of classical education and the Christian understanding of it, when do you think he went to school -- anybody want to take a guess? About fifteen years old when he actually left the house and went to school. Secondary education was from about fourteen to fifteen on. So this idea that children need to leave at age five – and now it's even four, three, to go to a babysitter -- is the exception, it's the innovation. And it's very dangerous and very problematic for the development of the child to leave his mother and father so early. Kindergarten and day care were entirely unknown during ancient times; the majority of the saints were homeschooled. If you look at the lives of the saints and you pay attention, you'll see that the idea of state school didn't exist. Education was done on a tutoring basis, and the norm was much later than it is today. St. Basil the Great himself supported the personalization of instruction as something necessary. In fact this personalization was on the level of individuals, not of groups of students. So when they talk about “schools,” in the first millennium at least, they didn't mean universities like we see them today, with massive amounts of people. They meant a teacher or two and a few students. That was the “school” in a lot of places. So, very few people were educated at the level that we tend to think. We think that back in ancient times people were educated. Well, very few of them were educated compared to the numbers who are today. Today we have a massive increase in the mass education of many people, but the level of education generally has declined immensely. And, when do you think that compulsory state education began? How many years ago? -- right at the beginning of the nineteenth century. So that's 200 years old, and it slowly developed; only in the 20th century do we see the kind of state education that exists today. You already know how to do this, how to put it into practice. This was a presentation that I originally gave to clergy in Greece, because the people (clergy at a clergy conference ) were asking me, "What is this homeschooling that you're doing?" I presented it to them, and so some of this is more applicable to people who are totally new to homeschooling. But there are a wide variety of things that people can do in terms of homeschooling in North America, in terms of interaction with other homeschoolers. Of course the Orthodox community is not that big; one needs to have discernment on what kind of interaction you're going to have with non-Orthodox homeschoolers, but there are plenty of things available in most communities today, so you can take advantage of that. These slides we’ve been looking at are some examples, some ways to put homeschooling into practice. My concern today is more about the history of compulsory state education. I don't know if you've seen this, but this is an example of more and more countries allowing homeschooling at different levels of legality. There are a few countries without presuppositions at all, not many. In some parts of the world, especially in eastern Europe, in a lot of places, it's illegal to homeschool, but that's changing every day. In Europe there are thirty countries in which it is legal to homeschool, although the homeschooling movements are pretty small in most of those countries. There are six countries in which it is illegal, with Germany being the most well-known and repressive. After that Sweden, which is not listed here because in Sweden its actually technically legal, but there is a lot of repression, and Slovakia, Bulgaria, Greece – Orthodox countries that do not allow homeschooling – Romania, and Holland. It is understandable in some ways why an Orthodox country would not be open to homeschooling as much as the western countries, because there would not have been the need historically. The rationale would be harder to sell in a homogeneous society like Greece, so historically there are reasons why people would frown on homeschooling in Greece. With the rise of many minorities and the decline of Orthodox education in the state schools, though, it makes a lot more sense to do homeschooling in Orthodox countries as we go forward. In England and France, there are thousands of homeschoolers, but it’s always a tenuous relationship. Although it grows slowly in England, it hasn't really established itself, and there's always pressure, and there are always laws. Right now there's another law that was just introduced to make it more restrictive. There's always a struggle in these countries, even though it is legal to homeschool. Eight thousand homeschoolers, as of a couple of years ago, in France. So these are some of the things that I found a few years ago which showed that actually – as you probably already know – homeschoolers did better on tests and academics. 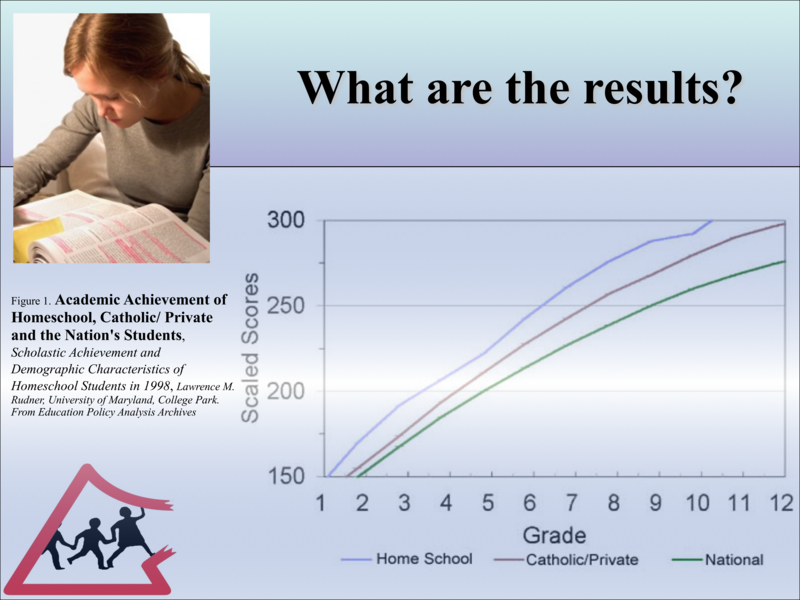 That's the main question that people bring up, especially in Europe, is “Well, homeschoolers really academically are not going to flourish,” when in fact they flourish and they do better than most students in the public schools, in most cases. Here's where we get to the history of compulsory school. And I want to go slow here and talk a little about the history because it's very instructive. This is my opening page and it's not an accident. I put this here intentionally to get your attention, because the spirit behind compulsory state schooling is not about school and not about education at all. It's about control. That's the history of compulsory state schooling. 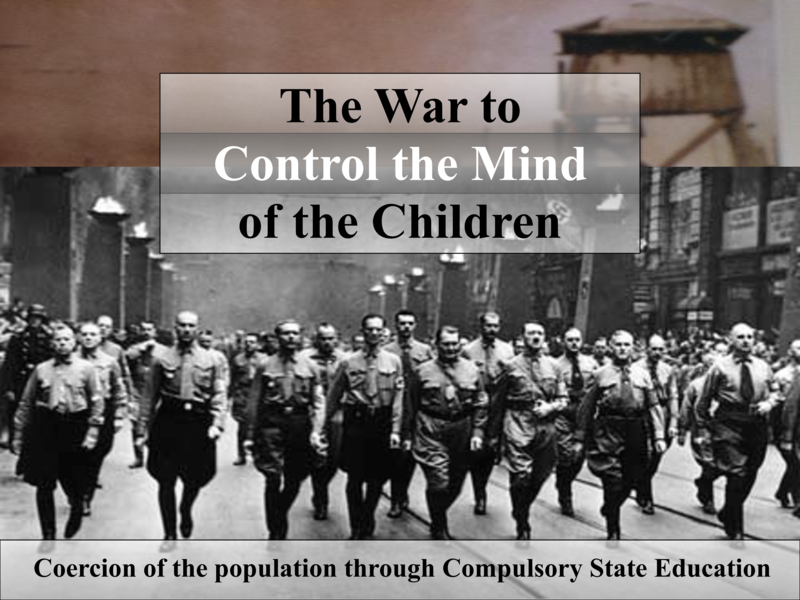 Compulsory state education has always been about control. There's an ideology behind it that pushes it, which is the controlling of the society, and also coercing the society in a certain direction. And this becomes clear when we actually see the history of compulsory state education. So, what do we mean by the phrase “compulsory state education?” Compulsory state education is not the citizen's right to access education, but rather it is the state's right to compel parents to send their children to public school. That's the proper understanding. Parents, when they're in charge – which they are recognized as being in the United States – can choose many ways to educate their children. But when it's compulsory state education, those choices are no longer available to parents. So the correct stance should be to provide the citizen with free access to education through various means, public and private. One researcher said that "the history of promotion of compulsory of state education is not directed by altruism, but by the desire of forcing the population into a mold designed by the regime." And that's how it started, when it did start, in Prussia. What are the roots of compulsory education? Well, they start with the Reformation. And it's not an accident. The Reformation was the force behind the introduction of compulsory education in Germany in the 16th century. 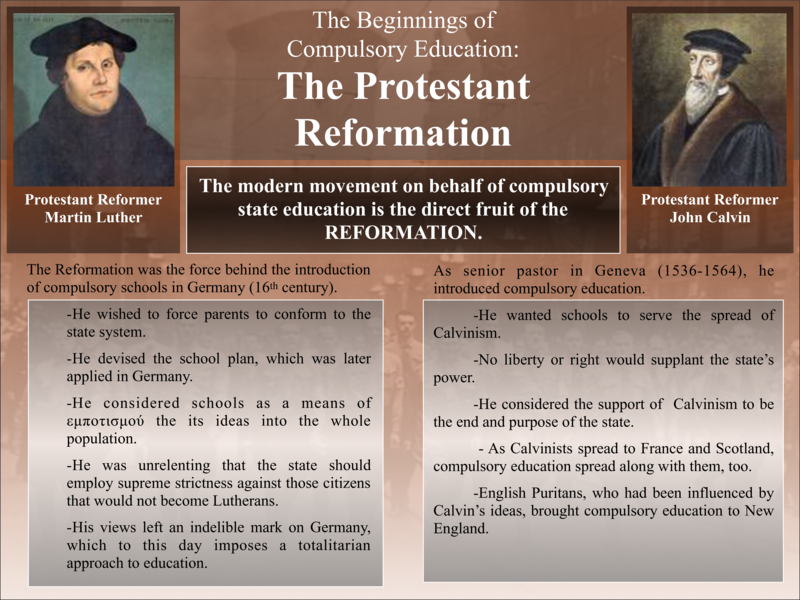 The Reformers, particularly Martin Luther, wanted to have parents conform to the state system. He devised a school plan, which was later applied in Germany. He considered schools as a means of implanting ideas into the whole population. He was unrelenting that the state should employ supreme strictness against citizens who would not become Lutheran. This was the age in Europe where people were persecuted for not following the state religion, including many Protestants who were persecuted by other Protestants, and his views left an indelible mark on Germany, which to this day imposes a totalitarian approach to education. On the other hand, John Calvin introduced compulsory education when he was head of his religious state. He wanted schools to serve the spread of Calvinism. No liberty or right was to supplant the state's power. He considered the support of Calvinism to be the end and purpose of the state. As Calvinists spread to France and Scotland, compulsory education spread with them to the other states. And English Puritans influenced by Calvin's ideas brought compulsory education to New England. The king of Prussia was the first one to really impose this on a statewide basis. This was Frederick William I, in the mid-18th century. He was known as the Soldier King and for his monarchist authoritarianism. He increased the Prussian army, created a centralizing bureaucracy, imposed limitations on trade, and inaugurated the Prussian compulsory school system, the first national system in Europe. A historian says, “He treated his kingdom like a schoolroom, and like a fervent headmaster, he whipped his subjects mercilessly.” The whole point was to create the school system so that he could have people in the mechanism of the state. This philosopher Johann Fichte, in his address to the German people right at the turn of the nineteenth century, was promoting the state as an instrument of societal progress, part of which was compulsory education. The aims of the utopian system, which began in 1819, were obedient soldiers, servile workers, docile civil servants, compliant administrative assistants, citizens who think identically concerning the major issues. His aim was not to develop understanding, but to socialize the children in obedience and submission. So socialization was always at the heart of compulsory state education. When people say, "You need to be in the state schools because you need to be socialized," they're right. That's what the main point of state education is. It's not about education. Of course, there are people there who really want education in spite of the system, and there are people who are getting educated in spite of the system, but we're talking about how it began and why it began politically. Intentionally, in the beginning, this first example of state education, only 8% of the children were given secondary education. Secondary education was not open to all the students. 92% of the children were educated at the elementary level only – intentionally left there – because the idea was not to bring everyone up to a grand level of Renaissance erudition; the point was to create a working force that could serve the new and rising power of the state, and industrialization. This is a list of when compulsory education was introduced in these countries. I've highlighted Greece, in 1834. At that point it was just after the Revolution, so it was very young, and it was free from the Turks, but immediately compulsory education was forced on Greece by Otto, the new king who was brought in. He brought the German system of education and limited -- almost got rid of -- the reading of the Holy Books in grade school. That was in 1834. In America from 1852 to 1918 -- we don't have exact dates -- compulsory education eventually got to 72%, one of the highest of all the countries. It very quickly rose in America, thanks to people like John Dewey, and centralization, and the closing of the one-room schoolhouses in the last part of the nineteenth century. So 72 % of the people by 1918, by the First World War, were already in state schools in America. That was seen as especially necessary in America because we had such a divergent population and they wanted to form a common mind and society. So again in America, we see that the main thrust here is not education per se, but socialization, and the needs of the society or the state. So, the nineteenth century saw the slow rise of compulsory education, but that was still only to the third, fourth, fifth, at the most sixth grade. It wasn't until the totalitarian governments in the 20th century that you had this very quick increase to eighth, ninth, tenth, and even twelfth grade. And you can see here this was all happening right about the time of the First World War until the Second World War. The first to apply compulsory state education and to declare homeschooling illegal were these states here (USSR, Germany, Italy). In Russia, right at the time of the Revolution, Vladimir Lenin introduced a new system of universal compulsory education. Lenin established four years of compulsory elementary education in the countryside and seven years in the cities. In 1938, the National Socialist leadership under Hitler signed the Law for Schools by which it rendered homeschooling and every other alternative educational method illegal, and this law is still on the books. This is still the law, when they go and check, “Is it legal? Is it not legal?,” this is the law they're referring to. It essentially has not changed since that time. In Italy in 1923, Mussolini and the minister of education, a guy by the name of Giovanni Gentile, created a new education system suitable for the Fascist regime. They made education mandatory up to the age of fourteen. That is what we see eventually happening all over the world, but they were one of the first. Right now in Europe – in America this is not the case, thanks be to God – but in Europe it's really a state of war between homeschoolers and a few states, where we have repression. Germany and Sweden are the most notable. Germany is the most authoritarian in the world. They persecute homeschoolers. They have fines, imprisonment, and even abduction of children by the authorities. You can go online and read stories of this. And we have one story here of a family who - I think it was in Tennessee - had sought asylum here for a few years, but eventually I think they were forced back to Germany. In Sweden, there have been some very high-profile cases of the state taking away children who are homeschooled, and one in particular I remember where a mother was on her way to the airport, or she was at the airport, and they went and took her child away. To this day, as far as I know, that family has not gotten their child back. And there was no other legal claim, except that she was homeschooling. So, this is something that in Europe is still hotly contested, much more than in America. 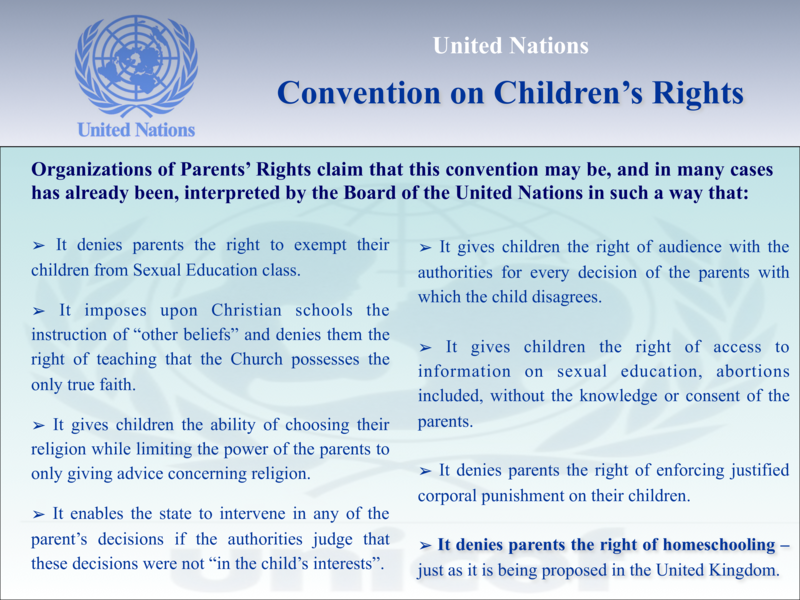 Now one of the international documents that's been signed (Convention on the Rights of the Child) that is ostensibly for the sake of the human rights of the child, has within it a lot of language – socialist, communist language – which many people point out is very detrimental and problematic for the freedom of parents to homeschool. So this is something that also exemplifies the struggle, the war against the freedom of parents to raise their children and teach their children as they see fit. This document denies parents the right to exempt their children from sexual education class -- this has not been enforced in a lot of places, but the document has been passed by the United Nations. It imposes upon Christian schools the instruction of other beliefs, and denies them the right to teach that the Church possesses the only true Faith. I think there is something right now in the state of California, a law that would penalize schools and churches, anybody who’s paid to teach, if they taught that homosexuality was an abnormality. So it's right now in the State House in California, something similar to what you see here in this document of the United Nations. It gives children the ability of choosing their religion, while limiting the power of the parents to only giving advice concerning religion. It affirms that children from a young age should be able to decide if they want to go to church or not, even they're under the guidance and care of their parents. It enables the state to intervene in any of the parents’ decisions if the authorities judge these decisions were not in the child's interest. That's exactly what's happening in Sweden -- that's the kind of approach the state has for the children that have been taken away. It gives children the right of audience with the authorities for every decision of the parents with which the child disagrees. It gives children the right to access information on sexual education, abortions, without the knowledge or consent of the parents. It denies parents the right of enforcing justified corporal punishment of their children (spanking), and it denies parents the right of homeschooling. This is the same law that was proposed back in 2009 in the United Kingdom, which actually failed. Why am I telling you all this in a talk called "Have Faith?” Well, because it's not just about you and your child. It's actually about the survival of the Church, it's about the survival of Christian identity, it's about keeping our children pure from an ever-encroaching demonic system of control. And if you see and understand the history of compulsory education, you realize how important it is for us to retain control over the education of the children. It's a matter not just of education, as I said in the beginning, but of faith and of Christian identity and survival. Three things to consider, as to why homeschooling is so necessary; not an option, but a necessity. It's pretty obvious, I think, in America. But in Greece it's perhaps even more obvious in many ways, because we have the stark contrast of a Greek Orthodox culture and society being trampled upon by European and Greek secular atheist ideology. It's very startling in Greece to see the change within the last 20 years; I was there, and saw the change in 20 years. People who've been there for 50 years have obviously seen this massive change. So, it's very clear to us that the state will be used to impose anti-Christian ideology on the children. That's the first reason why it's essential. The second thing is that increasingly, public schools are not educating. I was just talking to a Romanian woman who teaches in a school in Pennsylvania and I asked her, "How's it going in the school there?" and she said, "Well, I'm pretty much a babysitter. I go there and I take care of the kids and I make sure they don't hit each other." And that's where we've devolved in terms of state education in many places, because of this dissolution of morality and society. Increasingly there's no expectation for morality. It's not easy to impart education to children who are not being raised in homes where that is being encouraged. And number three: instead of being a place of learning, state education is becoming a reform school of the new man. And just to give you some examples of this: state education today, as we said, is in the hands of anti-Christian forces. It has a monopoly -- at least in Europe it does -- on education. The rights of parents over the education of their children is violated. Besides that, obviously we all know also what children go through if they're Christians and they're a minority in a school; we know what they go through in terms of bullying and pressure to conform and go with the broad path. And the state actively influences the formation of the conscience, the ethos, or the behavior of the children of Christian parents who reject Christian education. One of the things that is subtle, but very important, is this ethos, the Orthodox ethos: how is it going to be cultivated when the children don't have examples? This is one of the most important things about educating your child at home, and it’s why we have to have faith and be courageous, and remain in this, no matter what outcome we might have educationally. I remember many times with my children, some did better, others did worse. I was on some days a good teacher and on other days a very poor teacher. In some classes I was a terrible teacher and we ended up getting someone else to come in. So there are plenty of reasons to say, "Well, I'm not doing the best for my children." But in fact, those are not the first reasons why you homeschool. The education of the child is not the first and foremost reason why we homeschool. And so you have to check that – that despair, or that lack of courage, or lack of confidence – and always remember that what we're imparting here is much more. And it's not just on the level of the reason, it's not just on the level of the preparation to become a good member of society, but it's to remain faithful to Christ. And then finally, the whole creation of the new man. We see increasingly demonic and blasphemous images and language used, and it's becoming the norm. I was amazed: I was coming out on the plane to get here and I was focusing on my talks. And I have a man on my left who's a middle-aged man, and man on my right who's a middle-aged man. They both have tablets and they're both watching what I thought would be something a fourteen or fifteen-year-old would probably watch. It was terribly distracting. It was demonic, and it was violent. I had to spend four hours, five hours on this plane with these two men watching apparently two or three movies of the most demonic and blasphemous images. I can't imagine – now these are grown men – what the young men and young women who are in the schools today are doing with their tablets, what kinds of things that kids are being exposed to, and this is just five hours on a plane. Now over five, ten, fifteen years in the public school, what are they going to be exposed to? So the “new man” that is being formed – the inversion of Christ – and his demonic activity, is another basic reason why we need to remain faithful and not lose hope. There is also this totalitarian spirit and approach of indoctrination in terms of sexual perversity, transgenderism, and all the rest, which is very prevalent today -- and just the total spiritual bankruptcy that we're seeing in the schools today. One of the reasons for homeschooling that maybe people don't think about, and one of the things that I've seen a lot of parents struggle with and we've struggled with, is the question of the internet. I don't know how you all are dealing with it, but it is a struggle. 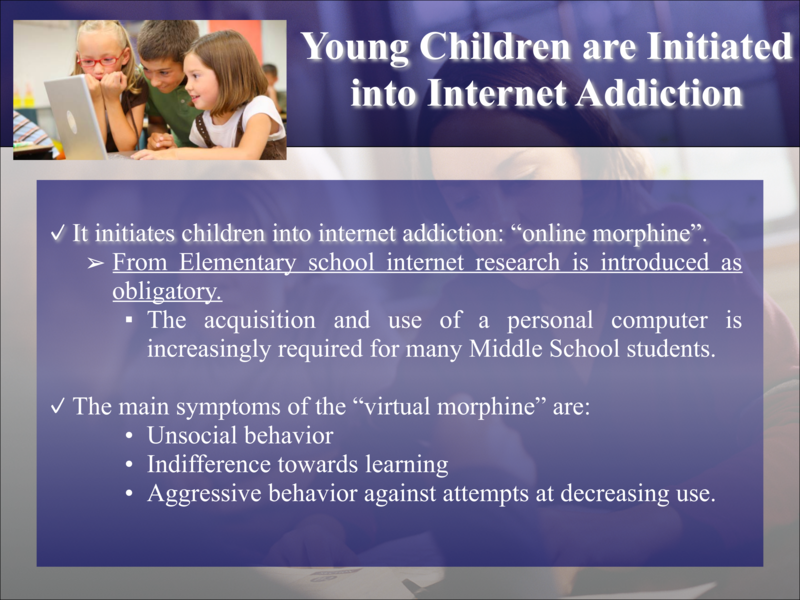 When children get exposed at a young age to a computer screen, the addiction that can follow is really destructive for their spiritual life. All around the world -- I'm sure it's the case here in California – at younger and younger ages, children are getting exposed, and are expected to come to school with their laptop or their tablet, and it becomes a way of life from a very young age. But it's been shown by a number of studies that this is very destructive, not just for their attention span, but for the development of their minds. So another thing that we need to avoid, that we can avoid, and that we should avoid in home education is the exposure and the addiction of the computer, or the TV screen, or whatever it is that they might be watching. It creates unsocial behavior, indifference towards learning, and also aggressive behavior. So, this is another danger that is present. This made an impression on me when I was doing research for this: the Baptists, which I guess is the largest Protestant group in America, have been planning and discussing a mass exodus from public schools for some time. And if they understand what's at stake, and understand the urgency of homeschooling, I think the Orthodox should definitely understand it as well. It says in this document that I found from the Baptists, "As Christians we ought to be planning a Christian education future for our children. Christian parents have a duty to provide their children with a Christian education." Truly in Scripture it's very clear, in the Proverbs and elsewhere, that that is one of the main tasks of the parent -- not education per se, but formation of the soul of the child. And when we stand before the judgment seat of our Lord, He's not going to ask us if they got into Harvard or if they were lawyers or doctors. He's going to ask us if they were faithful and if they had made progress in purification and illumination and deification. And this Baptist document says here, "A few hours at Sunday school and at church will not have a greater influence on the faith and worldview of the child, than forty or fifty hours a week at public school." So if the Baptists get that, then we should too. Another quote here: "The acquisition of complete control of the education of the youth of the state is an integral part of controlling the population." These are communist, socialist ideas that are behind all state education, even in America. Famously, Fr. Seraphim Rose said – he repeated it, I don't know if he actually said it: “What they experienced in Russia yesterday, we'll experience in America today.” The reason that's the case is because communism and capitalism are two sides of the same coin. They're both godless, and they're both run by greed and passion and not by virtue. They're also totalitarian in terms of their spirit. One is a political system, and the other is an economic system, but they're both totalitarian. So this spirit of control by the state is very likely to be our future here, or it already is. FInally, and this is the last thing, and then I'm going to talk a little about faith. We're heading again to the secret schools. Do you know what the secret schools are in Greece? They were in the Turkish period. The Christians had secret schools. They were forbidden to have schools by the Turks. So they went underground; they had schools in the churches or in the homes. The priest, or whoever was educated in the community, in the villages, would teach the children using the liturgical books of the Church. And the great educator and apostle to Greece, Saint Kosmas Aitolos, said famously when he preached and went around Greece at the end of this period in the 1700's, he said to them all, "you must educate your children, open up schools if possible, but educate your children”. For the purpose of what? -- and this is what I'll get into in my second talk -- for the purpose of learning the faith and reading the Scriptures. He did not go around Greece to open up schools so that they might become educated, per se, but so that they might become educated in order to learn the faith. This is where we're headed. And this is why we have to understand that our role is not to have great ideas for our children's educational future, but to be focused on the preservation of the faith, just like St.Kosmas was with the Greeks. That's why we're educating our children. That's the role of education in our life. If it's beneficial and salvific, that's the end goal of their education -- to serve their salvation and to serve the Church. So, a few words and then I'll close with some thoughts on faith today. Homeschooling is a major part of our struggle to save our children from the hostile environment of contemporary education, and is a place where we create an oasis of Christian formation. Again, as I said, it's not a personal decision only. It's an ecclesiastical need. It's not about better education. It's about salvation. It's about survival as we go forward as Christians. And it's a necessary response to anyone who's seeking salvation and seeking to be a true Christian, and to raise true Christians. So, it's imperative for our life, if not for our survival as Orthodox Christians - it's imperative for our spiritual life. Although we struggle now day to day, and we're going to struggle, to become better at what we do for our children, always keep in mind that we're heading into very difficult days, likely of persecution eventually. If we're going to remain faithful then we need to come back to our children and go deeper, and homeschooling facilitates all that. We talk about faith a lot - and two words about that - because as Father said in the beginning, we try to publish a lot of things supporting the Orthodox confession of faith, and many times when we talk about faith, we have in mind this confession of faith, but really there are two kinds of faith, and both of them are necessary. The first is a prerequisite for the second. The first kind of faith is the confession of faith that we make as Orthodox Christians, and this is the foundation upon which we can then live a spiritual life. Without this foundation there is no spiritual life. To put it in a figurative way, the confession of the Orthodox faith, which is the presupposition for the spiritual life, can be seen as the fence or the wall around the house of faith, which is trust in God. So, in order for us to go deeper in the life of the Church, we have to first establish these boundaries. That was the term used in the Ecumenical Councils to describe the decisions of the Fathers. It was exactly this word: ‘oros’, which is 'boundary'. So what were the Fathers doing in the Ecumenical Councils? They were laying down the boundaries and they were saying “outside of these boundaries do not go,” because salvation is not attainable. Salvation is the whole reason for the existence of the Church, the whole reason for the Incarnation, the whole reason for everything that Christ did for us. Everything He did for us was for one reason: it was for our salvation. So, everything the Fathers have done, and everything that has been accomplished in the Ecumenical Councils, was for our salvation. But, that is not enough! The confession of the faith is not enough! We have to go deeper in the spiritual life. We have to go deeper and increase the trust. That's the second kind of faith. So, when we talk about faith, there are two kinds, and both of them are necessary, and the second comes about when we go deeper into purification, and prayer, and repentance. Then trust increases. You can see this throughout the Scriptures. All of the great miracles of the Lord had as a presupposition faith and repentance. So, when we approach the Lord, whether it be in the Mysteries, or in our prayer, there are presuppositions, and they are these two kinds of faith: the confession of His Divinity, which is the same thing as saying the Confession of the Orthodox faith, and then trust in Him, and according to your faith, the miracle happens, as He says in the Gospel. But according to our trust in Him, the grace of God is imparted to us in the Holy Mysteries. So this two-fold faith, have it in mind -- in your own life, but also in the life of your children when you're trying to impart the Orthodox faith in homeschooling. There are always these two aspects that you have to impart to them. They have to understand the boundaries and the foundation of their life, which is the confession of Christ's divinity and His Church, and then they have to go deeper in trusting Him. And then this will be salvation for them. That is what this image at the end is meant to imply: the passing on of the faith from one generation to another. This is the future of Orthodoxy. It's going to be in the small homes between parents and families, in the small chapels and churches in the catacombs of the future. This is where Orthodoxy is going to flourish. And we need to do that. We need to go back to the basics. Thank you very much for your time.